The tournament between Mexico, the United States and Canada to see who takes home the gold has become a classic fight for supremacy in North America; to date, Canada holds the lead. 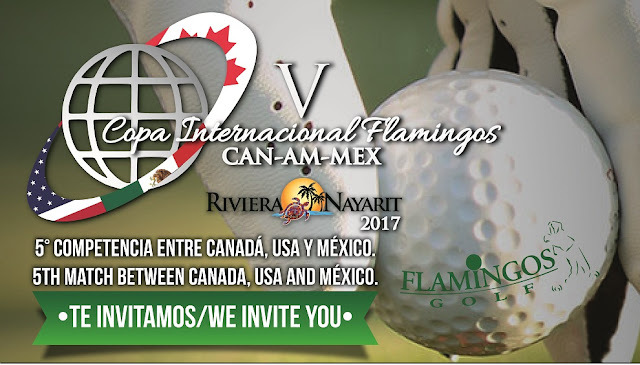 The Flamingos Golf Club, the first in Mexico’s Pacific Treasure, is ready to host the V International CANAMEX Flamingos Riviera Nayarit Cup 2017 next Saturday, February 18. Teams from Mexico, the United States and Canada are looking to take the North America crown in this Riviera Nayarit golf Classic. The current champion in Canada, which has won three out of the four tournaments so far, with Mexico winning the remaining one. The prizes for Hole in One are a 2017 Buick Encore at Hole 6 and a golf cart in Hole 8. There are also 32” TV screens and audio equipment for all the closest-to-hole shots at the 13th and 16th holes, respectively. There will also be a raffle for all competitors with a grand prize of a complete Taylormade M2 set of clubs. The 18-hole tournament will be made up of 9 Holes A Go-Go and 9 Best-Score Holes by a couple. It will be a couples’ game made up of two players per country, meaning three couples per hole. Registration is MX$1,500 per person. The registration and payment can be made the same day on Saturday, February 18 at 7:30 a.m. at the Pro Shop on the golf course; the first swing will tee off at 8:30 a.m.
At press time the teams were almost complete. For reservations please call 01 (329) 296 5006. For more information, visit www.flamingosgolf.com.mx.